I recently had a prospective customer, a museum buyer ask me if Dunitz & Company could produce "rainbow" jewelry. 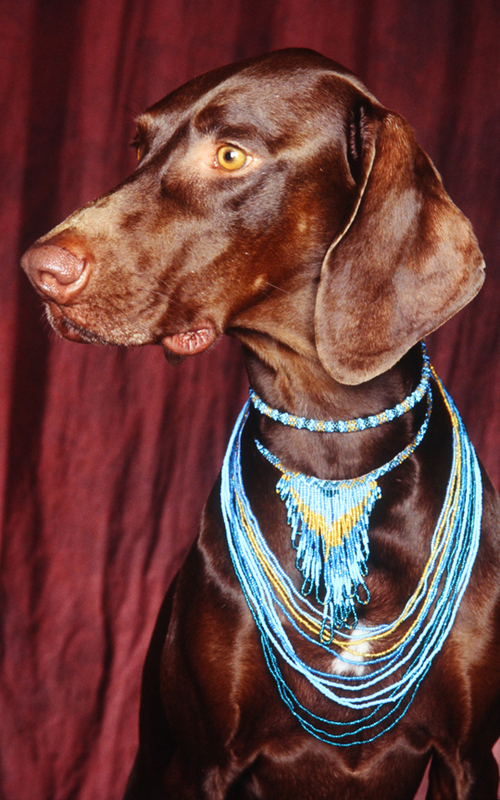 He thinks our fair trade beaded jewelry may be perfect for a LGBTQ show his museum will be hosting next year. I smiled and said of course. 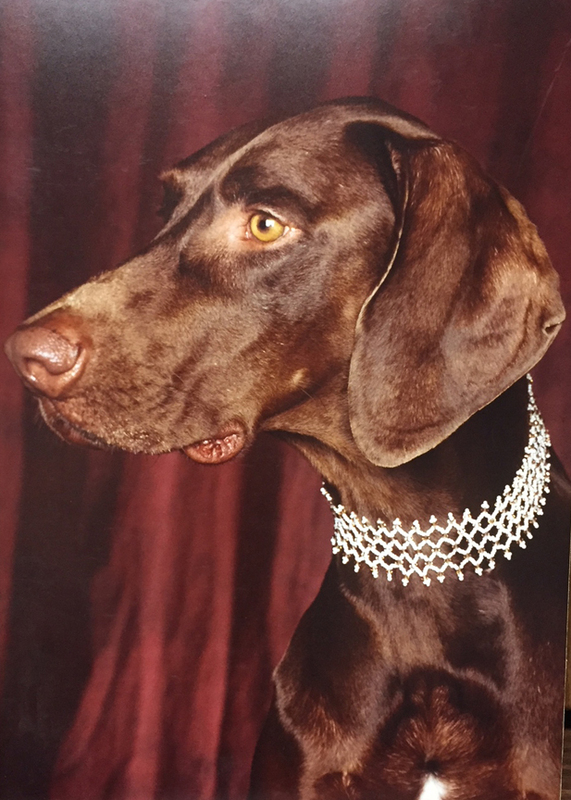 I was reminded that once upon a time, our mascot, and my first dog, Byron was our best and perfect model. In the mid-90's we offered rainbow jewelry. And we sold a lot of it. I left my job in Corporate America in 1989 and never looked back. I was young and stupid and hopped on a plane to Guatemala in search of beautiful handicrafts. I didn't know this exquisite country was in the midst of a civil war. (OH...the stories I could share from that time.) While there I met the first women (one American, one German) who taught Mayan women how to create beadwork. Yes, we were on the ground floor. We had no competition. And the retailers 'ate up' everything we created and showed them. 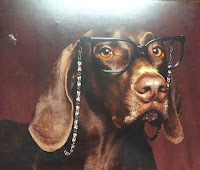 It didn't matter that our prime model was a Vizsla/Weimaraner. The buyers would have so much fun in the Dunitz & Company booth. 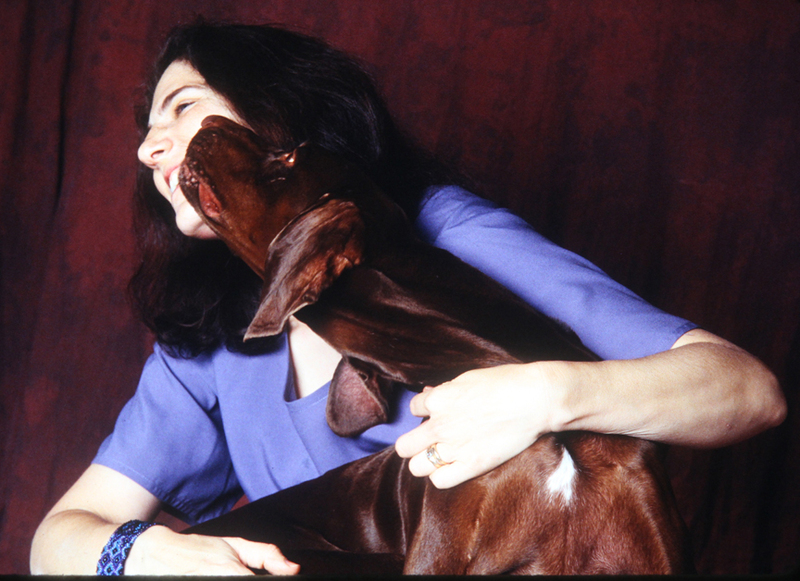 And the portraits of Byron always stirred up great conversation about our beloved pets. I mean, seriously. Who could not laugh about a dog wearing glasses? I have a few of Byron's portraits are on display in the office. They're propped up on the file cabinets. Unfortunately a couple of fallen behind the cabinets. This means I won't see them again until we move from 2142 N. Cahuenga Blvd., or figure out a way to go paperless and rid ourselves of customer files. My guess is neither will happen anytime soon. This choker, which we still sell on Shop Dunitz is ladled with Swarovski crystals. Gosh, I'm certain we sold one recently. Unfortunately with high material costs, this design is no longer viable for our wholesale markets. I used a photo similar to this one to create promotional buttons. I'm guessing the printed portrait of that image is behind the file cabinets. (If you look closely, you'll see this photograph does not match the button exactly.) 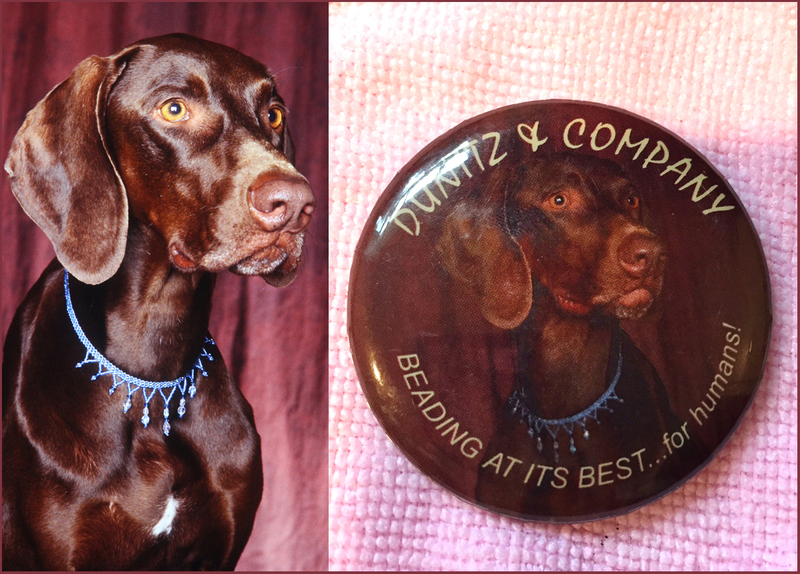 "BEADING AT ITS BEST...for humans". Yes, I was silly. But, Byron and I had so much fun together. He was so spunky and full of energy. Did I saw he was a Vizsla crossed with a Weimaraner? Gosh. Even his paws got in the act. Several images even landed in the press. Gifts & Dec. Giftware News. Even, Dog Fancy! 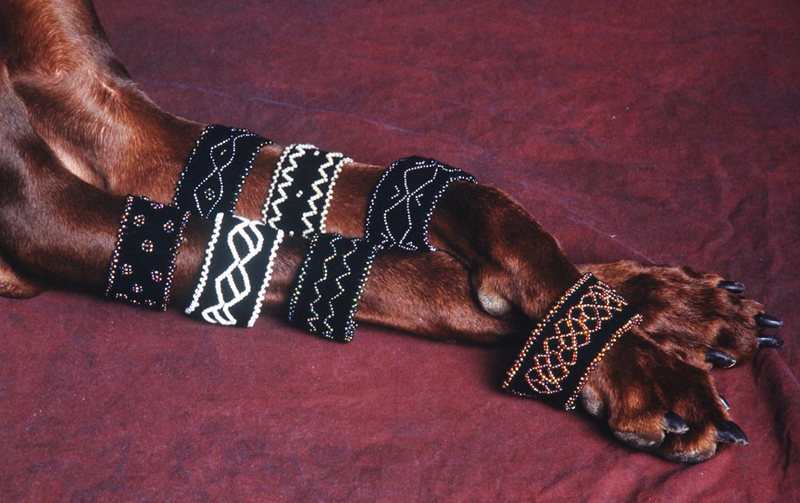 Many years later, I actually offered a line of high-end dog collars. (They were made in India.) 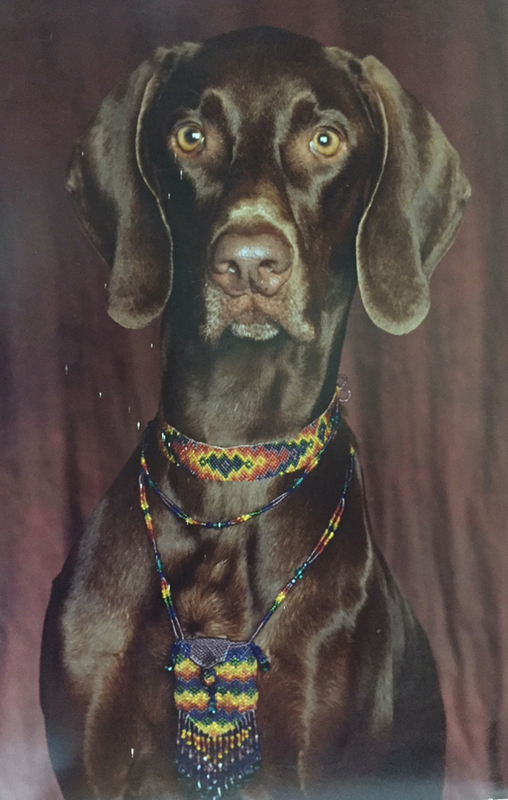 Pantone color expert, Leatrice Eiseman discovered us at a show and asked if she could use Byron's portrait (wearing one of our dog collars) in her book, The Color Answer Book. Yes, he's now featured in one of her publications for all of eternity.